Thirty years is a long time to wait but our city is once again on top of the baseball world. The Kansas City Royals are World Series champions for just the second time in history and our town has never felt so alive. In a five game series where the Royals trailed more than they had the lead, it goes in the books as a 4-1 series rout that people will talk about for years to come because of the unique way Kansas City got it done. The Royals didn’t really have a dominant performer outside of starting pitcher Johnny Cueto’s game two, complete game, two hit gem, and it was very hard to pick an MVP. There was no David Ortiz or Madison Bumgarner that carried the other 24 players, this was a complete team win for the Royals, just as it was all year. The national perception, perhaps rightly so, is that there is no star power on this team. But it’s just the way Royals fans like it and wouldn’t have it any other way. No Mike Trout or Bryce Harper grabbing all the attention, just a team full of guys and a lineup 1-9 that has no holes. Most losing postseason teams have trouble at the bottom of the order and get exposed. Not the Royals. Now Eric Hosmer and Salvador Perez can go do the Tonight Show with Jimmy Fallon and get attention the old fashioned way. By earning it. The Royals have taken the “book” of baseball and tossed it in the garbage. No 40 home run guy, no ace of the pitching staff. GM Dayton Moore and Manager Ned Yost really valued things that don’t show up in a box score. It’s seems silly that other teams believe a strike out is just another out. The Royals prove that’s wrong. They put the ball in play and are so disciplined in their approach. The Royals don’t let very many good pitches go by, Alcides Escobar leading off is proof of that. What’s wrong with a leadoff guy up there hacking? If you get a good pitch, let it rip. You can stand, watch pitches, make an out, and realize the best pitch you got, you never even tried. But not the 2015 Royals. 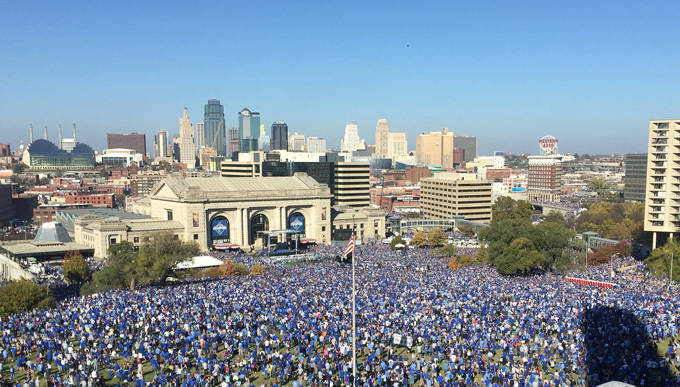 The Royals put pressure all over the Mets in this series and now a record setting parade on a 70 degree November day is the result. New York had a 6 run lead in game three and it’s the only time they even managed to get comfortable. You’d better build a big lead to put the Royals away and the Mets could only do it once. Fox TV analyst Harold Reynold put it perfectly when he said it feels like the Mets have to hit a home run to win a close game and all the Royals have to do is find a way to get a guy on first base. Dyson on, steal a bag and Christian Colon comes through. Christian Colon. Nobody can even remember the last time he batted but there he is at first base a true baseball hero. The rest is history in the books. Right now, everyone is a champion in Kansas City. The years of futility are long gone. The second guessing of how Moore and Yost built this thing has faded. It’s an absolutely remarkable season for KC and everyone in the organization has earned a much deserved title. World Champion. The only thing that may be more impressive than the Royals play is the support of the fans. The parade route was less than three miles long and proved to be just too short as hundreds of thousands of fans showed up, many that couldn’t see a thing. It’s astonishing to see a city shut down like this and see how everyone responds. On rooftops, in trees, on top of bus stop covers and in places, 50 people deep on the side of the road. Union Station and the Memorial at Crown Center has a gathering like nobody’s seen since Woodstock. It’s truly a crazy, crazy site to see how important this team and this title are to Kansas Citians. So for now, we just sit back and enjoy the off season. As champs. This team will be back in 150 days playing the Mets on opening day at the K. Getting their rings. And they will be back in World Series contention again, probably with a few new faces. So get your tickets fast! You’re at the right place here and in good hands with all my friends at Tickets For Less . I’m proud, and Sportsradio 810 is proud, to have a great partnership with a great secondary ticket provider that is worthy of a championship city like ours. And as good as we all feel right now, it even somehow seems possible the Chiefs could be turning it around trying to do their own Houdini act. It won’t deliver what the Royals delivered for us, but right now in Kansas City, it feels like we can do anything! Well played KK. Thanks for the logical insights of our city & our team. We were represented to the world. Pride, humility & a bit of nastiness when treated poorly i.e. Mike Boddicker. I wish we can carry the civic pride for many years to come. Congratulations to all of KC, not just the Royals!